Getting keyboard keys to display properly in HTML can be hard. This blog shows two ways which don't work, and one way (using CSS, inevitably) which seems to do the trick. 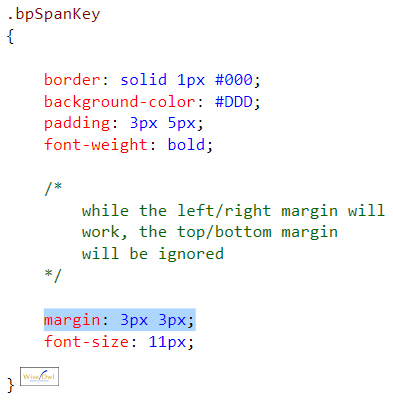 The answer - as always - is to make good use of CSS. This blog shows a couple of false trails I went down, then a final answer which seems to solve the problem. I hope someone finds this useful. If you know of any improvements to make to this procedure, please share them with the world by adding a comment below. It doesn't seem to work on all browsers. And anyway, how do you then cope with keys like CTRL and ALT ? My next idea was to buy a stock of keyboard images: how hard could it be to find some? After some searching, the closest I came was from Shutterstock, but even then you had to pay 29 pounds to download 12 images. And even if I could find a perfect image for each key, I'd still have to find a way to include them in HTML. The selected text won't work: because the span tag isn't a block style, the top/bottom margin will be ignored. 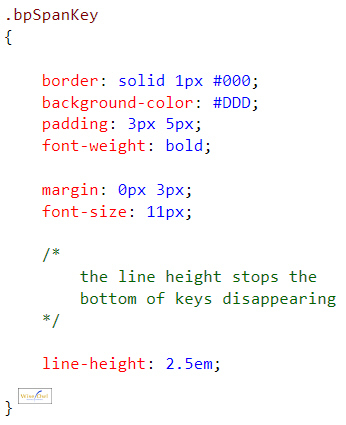 Setting the line-height property forces browsers to set a minimum line height for blocks of text containing our span class. In Firefox, IE and Chrome, at any rate, this seems to solve the problem. Unfortunately, it means that arrow keys like Up Arrow and Down Arrow don't look that elegant, but you can't have everything!